Diary excerpts and photograph courtesy of Lilly Library, Indiana University, Bloomington, Indiana. The Barber Papers, including the diary, are housed in the manuscripts collection of this library. Barber's diary, Holding the Line, was edited by Robert Ferrell, Distinguished Professor of History at Indiana University, in 1994 and published by Kent State University Press. May 8, Friday: This morning we marched ten miles and arrived at Brookhaven about 12:00. We here took the cars and reached Jackson before night. I had my gray, "Buckner," badly crippled in putting him on the cars. At Jackson, I met Captain Flautt just home, who brought with him Joe and a long letter from home. We marched through the town and encamped a mile and a half on the north side. I spent the time till bedtime talking about home and reading my letters by the firelight. May 11, Monday: On Monday morning, May 11, we again took up the line of march on the Raymond road. The enemy were reported advancing from Port Gibson in strong force. I left my crippled horse at the house of Mr. William Bracey, seven miles from Jackson, who promised to take care of him and purchased another, a very indifferent one, for $400.00. On Monday night we encamped half a mile north of Raymond. News reached us here that the enemy were still advancing. May 12, Tuesday: This morning we heard that the enemy were in force within five miles. About 11:00 they were within two miles on the Port Gibson road. We marched out to the graveyard on the south of town. The Yankees soon commenced skirmishing with our pickets and the artillery were soon engaged. About 12:00 our regiment advanced along the Gallatin road, then turned to the right through the fields and formed a line of battle behind a hill and in front of a thick woods occupied by the enemy. The Seventh Texas was on our right and the Tenth and Thirtieth Tennessee on our left. The Third Tennessee and Seventh Texas were ordered to drive the enemy out of the woods. General Gregg supposed them not to be in large force and promised to send the Tenth, Thirtieth, and Forty-First to attack them in the rear. The Third advanced to the brow of the hill and commenced descending the slope toward the woods in line of battle. They advanced in most gallant style, yelling until the woods resounded. A hundred yards from the edge of the timber our skirmishers under command of Captain Mitchell dashed forward and the enemy's skirmishers opened fire upon us. Our line rushed forward at double-quick and a short distance from the woods we received a volley from a line of battle within the woods. Our men though falling fast never faltered but still advanced and rushed into the timber yelling like demons. The enemy's line was broken in a moment and our men followed close at their heels, shooting and capturing them. The undergrowth and briars were so thick we could scarcely make our way through. The enemy again formed a new line in the woods behind a bayou, but our men rushed madly forward, jumped into the ravine, and climbed the steep bank on the other side. Again the enemy gave way and fled entirely out of the woods in our front into an open field. We followed them to the edge of the woods and there beheld another line in the field. A few volleys from the Third scattered them and they retired out of range. In the meantime we had passed a body of the enemy on the left unseen, and as soon as we were past they opened a galling fire upon our left flank and rear. Our men by this time had shot away all their ammunition and a fresh column was advancing directing upon us. No support appeared upon our rear or left and we had been so terribly cut up and scattered in the thick woods that the colonel thought best to order a retreat. We were barely in time, for before our left wing could fall back the Yankees succeeded in capturing some of our men who were exhausted. All the way back we were severely galled by the enemy on both flanks. We had to leave many of our wounded in the woods, no being able to carry them away, in spite of the entreaties not to be abandoned. We at length reached the place whence we had made the charge and again formed one line but 187 of our number were missing. But the noble old Third, though shattered and bleeding, and repulsed by overwhelming numbers, preserved her name unsullied. Officers and men all had done their duty. All our other regiments engaged were also driven back and the brigade suffered a loss of 530. We had twenty-seven killed, ninety wounded, and seventy missing, many of whom were supposed to be killed or wounded. Our whole force then fell back to Raymond and immediately commenced their retreat. 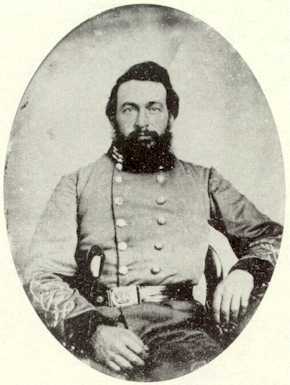 Tonight we encamped at Mississippi Springs, five miles from Raymond, where we met General Walker's brigade of Georgians. We lay down in an open field and in a few minutes forgot all our losses and disasters. Dr. Bowers remained at Raymond with the wounded. Lieutenants Ridgeway of Company A, Darden of Company E, Farley and Rittenbury of Company I, were wounded also Captain Walker. Captain Cooper was killed. Lieutenant Murphy and Captain Alexander were missing. Editor's note: Captain Flavel C. Barber was a schoolteacher in Bryson, Tennessee, before he signed with the Confederate Army in May of 1861. On May 15, the night before leaving for duty, he married Mary Paine Abernathy. Their honeymoon lasted only one night. For the next three years, Barber carried his love for this woman to the battlefield at Fort Donelson- to the prison walls of Johnson Prison - then on to the battlefields of Port Gibson, Raymond, Jackson, and Resaca, Georgia, where he was killed. On May 15, 1863, after the Battle of Jackson, he recorded in his diary, "Two years ago tonight I was married. What changes have taken place since then. Then I anticipated a lifetime of unalloyed happiness but one year ago found me within the walls of a prison and the present anniversary finds me in the ranks of a retreating army, defeated and driven back before an overwhelming force. God grant that the next one may find me in peace enjoying the society of her whom I love best of all on earth." This was not to be, Barber was wounded at Resaca on May 14, 1864, and died the following morning, May 15, the day that would have marked his third wedding anniversary.